Paramchaitanya, All-Pervading Power of God felt as cool breeze or vibrations by those born of the Spirit during the Last Judgment and Resurrection! All-Pervading Power of God felt as cool breeze or vibrations by those born of the Spirit during the Last Judgment and Resurrection! In parts of the Bible but especially the Qur'n, it is stated that the unbeliever is one who neither recognizes nor appreciates the signs of God Almighty. The distinguishing mark of a believer is his ability to see those signs and proofs. Divine Wind will begin flowing after Self-realization It is written both in the Qur'an and Bible that during Qiyamah (Resurrection) those who get their Self-Realization will have Cool Breeze or Wind coming out of their hands, head and other parts of the body. The"hands will speak"to inform the individual of any wrong-doing on a particular finger(s) which correspond to certain problems. This experience is part and parcel of the human subtle system which is activated after the Baptism of Allah (Self-Realization). The all-pervading power of God is known in various traditions as the Param Chaitanya (Indian), the Ruh (Muslim), Ruach (Jewish) and the Holy Spirit (Christian). The Param Chaitanya is the power we feel in our hands as cool vibrations. This power penetrates into every molecule. It not only pervades the entire universe, it created and sustains the universe. The Param Chaitanya does not work in a mechanistic, scientifically-predictable way. It is the living energy of God's love. Thus, it acts to express the compassion and forgiveness of God. As realized souls, we can invoke and direct the Param Chaitanya through our pure attention. We use the bandhan as a way to surrender problems to the Param Chaitanya. The Param Chaitanya is the source of all forms of energy and matter. It is a conscious, compassionate power. In our subtle body, the Param Chaitanya integrates us. Each of our chakras and each of the deities who reside in the chakras are coordinated by the Param Chaitanya. Vibrations are the most powerful force in the universe. Almost anything can be"vibrated.”We can desire that something in our attention absorbs the pure energy of divine love. Vibrations flow from our hands to where we direct them. This can include food or water. The Param Chaitanya acts according to our will and desire. The more we are dynamic, positive and focused on our goals, the more results can be achieved by the vibrations. The source of the vibrations is the Adi Shakti, the primordial power. The actions of the Param Chaitanya are the expressions of The Mothering, nurturing and loving aspect of God. The more we can perceive the work of the Adi Shakti, the more profound is our blissful state of connection to God. Our everyday lives are filled with personal growth, auspiciousness and well-being. In Sanskrit, Chaitanya is related to the word for attention, Chit. Chaitanya, or the vibrations we feel, is the attention of the Divine. Whenever we feel burdened or exasperated by life, we can remember that in reality, we don't do anything. It is our belief that we are doing something that exhausts us. The Param Chaitanya in fact does everything. Our evolution over time is done by the Param Chaitanya. Our growth as spiritual beings is done by the Param Chaitanya. Animals simply obey the Param Chaitanya. Human beings are designed to be free and conscious of the workings of the Param Chaitanya. We use our powers of desire and compassion to direct and intensify the flow of vibrations, which can be called the attention of God. When we raise the kundalini of another person, we are not doing it. The Param Chaitanya is acting, obeying our pure desire. For the first time in history, thousands and millions of human beings can become aware of the Param Chaitanya, learn how to use the vibrations, and change the world as they change themselves. 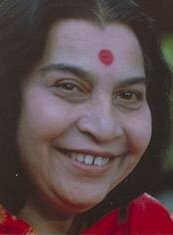 This is only possible because of the birth of the Adi Shakti, Shri Mataji Nirmala Devi at this time. Put the attention on Shri Mataji within the Sahasrara and feel the vibrations flowing from your hands and top of head. On that Day that the enemies of Allah will be gathered together to the Fire, they will be marched in ranks. At length, when they reach the (Fire), their hearing, their sight, and their skins will bear witness against them as to (all) their deeds. They will say: "Allah hath given us speech — (He) who giveth speech to everything: He created you for the first time, and unto Him were ye to return. "Ye did not seek to hide yourselves, lest your hearing, your sight, and your skins, should bear witness against you! And their feet bear witness to all that they did. The Noble Qur'n makes it clear that the testimony given by sinners in the court of divine justice will be utterly unique in nature, bearing absolutely no similarity to the juridical procedures of this world. The verses of the Qur'n that speak of the giving of testimony on the day of resurrection proclaim that the hands, feet and even the skin of the sinners will disclose the hidden sins that they committed during their lives and that were previously unknown to all but God; the sinner will stand revealed, to his utter dismay and terror. The animation of these witnesses and the testimony they will bear to the events that have happened in the world show that all the deeds we perform are recorded both in the external world and in the various organs and limbs of our bodies. When the conditions of this world are replaced by those of the hereafter, on the day when, as the Qur'n puts it," secrets are made manifest and none will be able to conceal anything or seek help from anyone.” (86:9-10) all the deeds that have been recorded will pour forth and begin to bear witness. We can indeed observe in this world a pale and feeble example of what is meant by things acquiring speech. A doctor, for example, understands the language of the body. The rate of the pulse may indicate fever, and yellowness of the eye proclaims the presence of jaundice. To give another example, we can tell the age of a tree from the circles within its trunk. "You were in a state of negligence; now We have lifted the veil from you so that your sight is today keen.” (50:22). "Let them fear a day on which their tongues, their hands and their feet shall bear testimony against them.” (24:24). “A day on which all the enemies of God will be drawn into the fire as they stand next to their destined abode, their ears, their eyes and the skin on their bodies shall testify to the sins they have committed. They will address their limbs in astonishment, saying, 'How do you testify concerning our deeds' They will answer, 'God who gave speech to all creatures has also given us speech. First He created you, and now He brings you back to Him. You concealed your ugly deeds not in order that your ears, eyes and skins should not give witness today, but because you imagined God unaware of what you hid from other men. It is this groundless assumption that has brought about your perdition, for today you are in the ranks of the losers.” (41:19-23). "Today We place the seal of silence on the mouths of the unbelievers and transgressors. Their hands shall speak to us, and their feet shall bear witness to what they have done.” (36:65). "On the day of resurrection they will find whatever they have done confronting them.” (18:49). "Why do they not believe in the signs of God? He is a witness to all that you do.” (3:98). "The earth will shine with the light of its Lord. The record of men's deeds will be brought forth and the prophets and the martyrs shall be summoned to bear witness and judge among men so that none shall be wronged.” (39:69). It should be borne in mind that such witness and testimony will not be restricted to the outer aspect of men's deeds. What is meant is rather testimony to the quality of deeds with respect to their good or their evil, and whether they represented obedience or sin: in short, the inner aspect of deeds. The giving of witness on the day of resurrection is a sign of honor and respect for those who are called upon, but it also indicates that while in this world they had a certain awareness of men's inner beings, that they were able to observe them just like their outer beings and thus to record their deeds with precision and inerrancy. It is obvious that conventional knowledge and sense perception are quite inadequate for testimony of this kind; it depends on a more profound mode of awareness that is able to embrace the inner dimensions of man, an awareness that transcends our normal capacities and permits an unfailing distinction to be made between the pure and the impure. All of our words and deeds are stored in the vast and mysterious archive of our body and our soul, and they will be brought forth in the tribunal of resurrection. The totality of our acts, good and bad, are stored up within us and will ultimately take shape to confront us. The reckoning of men's deeds that will take place in the hereafter will, then, be utterly unique. No one may hope to obfuscate the truth or to deny the contents of the precise record that is laid before him. Everyone will be compelled to accept the truth and to submit to its consequences. The hands, the feet and the skin will be called on to give witness; God from Whose knowledge not at single atom in the heavens and earth is hidden and Who is aware of the falling of leaf from a tree, will also be a witness; and the prophets and the Imams will bear their witness to whatever we have wrought. At present on Earth these vibrations are used during the Resurrection for spiritual self-cleansing, getting rid of bad habits and vices, healing others, verifying Truth, meditation, confirming God's guidance from within (self-reproaching Spirit), and so on. These vibrations are only felt when the physical body begins its metamorphosis into the spirit after Self-realization during the present Resurrection. These same vibrations (Kundalini) will one day testify for or against its owner in the Hereafter. All souls will be judged through vibrations after their physical deaths during Qiyamah through their own Kundalini. This massive record of one's deed on Earth can be easily read through vibrations issuing forth from their bodies. There will be no need for self-defense, cross-examination, evidence, witnesses, judge, jury or anything else whatsoever. God Almighty has already built the instrument of the Last Judgment within all humans — the Kundalini in the human body will bear witness for or against it's owner! This absolutely flawless Divine Judgment, whereby testimony is given by the most veracious of witnesses i.e., the human body itself. "There are lots of myths in the Bible and one of them is that at the Time of Resurrection your bodies will come out of the graves. This is not only for Christians, but also for the Muslims and Jews. Think of this — What remains in the grave after many years? Only a few bones. And if these bones came out how can you give them Realization? Think of it. It is a big myth. Not possible logically. Concerning the Great News  about which they cannot agree. In parts of the Bible but especially the Qur'n, it is stated that the unbeliever is one who neither recognizes nor appreciates the signs of God Almighty. The distinguishing mark of a believer is his ability to see those signs and proofs. He knows that these are not created in vain, and can realize the power and great art of God everywhere and find ways to revere Him. At various points in the Qur'n, expressions like," will you not take heed?”," ...there is a sign for thinking men," lay stress on the importance of pondering upon the signs of God. We ask all to ponder on the signs of God, both within themselves and without, and see if these signs and proofs are indeed that of the long promised Blossom Time of the Last Judgment and Resurrection. 1. Javed Khan, Islam Enlightened, New Delhi, India, 1988, p. 32-3. 13. What did Jesus (and the Comforter) ask people to"believe"?